An important part of the COMSODE methodology is to make datasets available in an integrated fashion. One aspect of this integration is the alignment of datasets by linking entities from one dataset with the same entities from another dataset. In this blog post, we describe how we applied Spinque’s Search by Strategy approach to linking vocabularies in the cultural heritage domain. Many heritage institutions describe their objects using terms from predefined vocabularies. Linking these vocabularies aids the integration of the collections. Hereto, The Netherlands Institute for Sound & Vision and Spinque teamed up to develop CultuurLINK. With CultuurLINK owners of a digital heritage collection can link their (internal) vocabularies to the Dutch cultural heritage hub. The hub contains several large vocabularies that are core for the community, such as the audiovisual thesaurus provided by the Netherlands Institute for Sound & Vision. Links to the vocabularies in the Hub enable richer descriptions for the collections, for example in the form of additional background information and labels in multiple languages. And, links between vocabularies connect formerly isolated collections, enabling richer and more contextualized access. 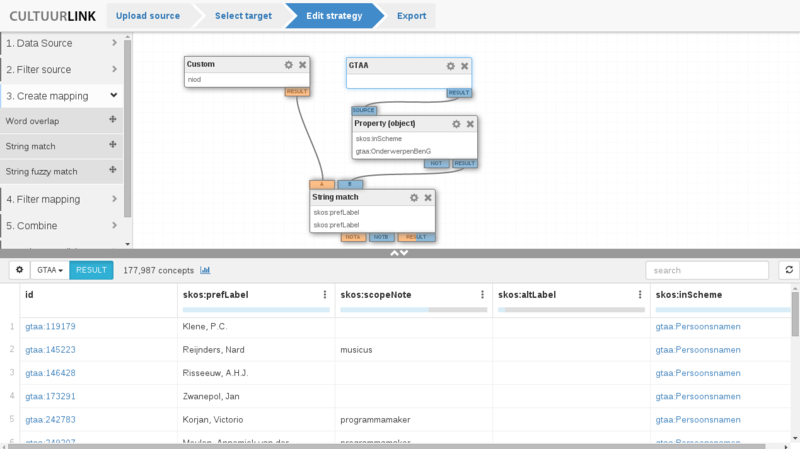 CultuurLINK: interface with strategy editor (top) and result table (bottom). Learn about COMSODE results, that support the sustainable open data management. Project COMSODE has received funding in 2013-2015 from the Seventh Framework Programme of the European Union in Grant Agreement number 611358.